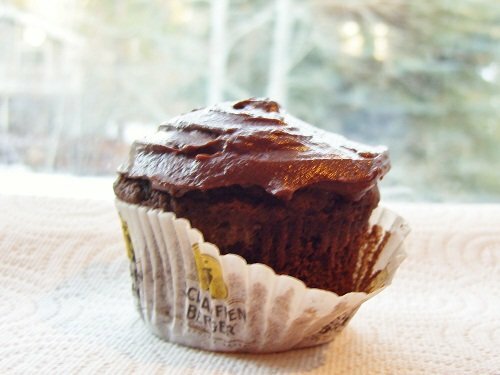 Quadruple Chocolate Vegan Muffin-Cakes – and a BIG Contest! 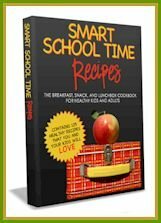 I created this recipe for a very cool event. 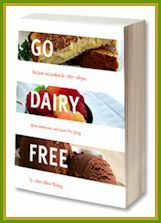 I’m co-hosting a big recipe contest and giveaway with ZenSoy, makers or organic vegan pudding and organic soymilk (made with whole organic soybeans, no protein isolates!). Details are here, but it is really quite simple … create a delicious (dairy-free) recipe using any variety of ZenSoy Soymilk or Pudding and you will be entered to win a 3-month supply of goodies! Now I know some of you may not have ZenSoy at your local grocer (but would love to win some so you can try it!) … so if not, feel free to improvise! Sorry, the contest is closed, but you can still enjoy the recipe below! Some ideas I have thus far that might inspire you include … Bavarian Cupcakes (with pudding filling! ), Pudding Pops, Vanilla Chocolate Chip Cookies, Fudge-Filled Cookies, Cappuccino Mousse Tarts, and oh yeah, the awesome recipe below! I finally made another attempt at high-altitude vegan cupcakes, and this time it was successful! When I asked if they tasted more like muffins or cupcakes, Tony said cupcakes, but my taste-buds are still torn. 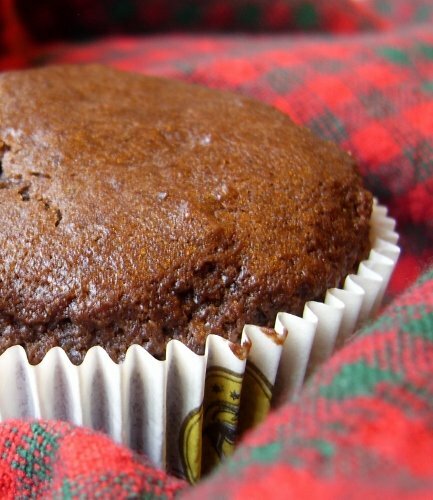 They are more indulgent than a muffin, but not quite as airy as a cupcake. Either way, they fit the dessert bill. The frosting was actually an afterthought. I made, and we enjoyed, about half of the batch sans frosting, but I’m a sucker for a nice thick frosting, so I will certainly make it again. Sorry, I wanted to give you a photo of the frosting, but all turned out fuzzy – the one below was the clearest one. And did you know that pudding makes a fantastic egg replacer? No joke! This recipe is Vegan, Dairy-Free, Egg-Free, Nut-Free, and High Altitude-Friendly. You can also turn this into a single layer cake, or pour into an 8 x 8 pan and bake for a snack cake. I got overzealous, thinking that this recipe batch should make just 6 cupcakes, so I ended up with 8 muffin-topped goodies. For a proper dainty muffin, I think you could easily get out 10 to 12. 1/3 Cup Semi-Sweet Chocolate Chips (or more if you want! I used Ghirardelli semi-sweet chips because the big bags were on sale, but honestly, they weren’t as good as the Dream Chocolate Chips. 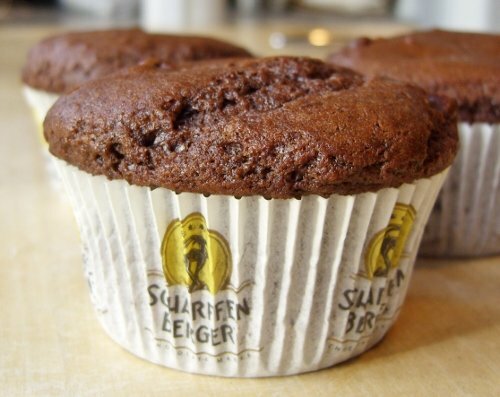 I would use those or the Scharffenberger Semi-Sweet baking Chunks (almost fruity in flavor) next time). Preheat your oven to 375º and line 8 (muffins) to 12 (10 to 12 for cupcakes) muffin tins with cupcake liners. In a medium bowl, combine the flour, cocoa powder, baking powder, and salt. In a separate mixing bowl, combine the sugar, oil, milk alternative, pudding, and vanilla. Fold the dry ingredients into the wet. It’s okay if there are a some little lumps remaining. Fold in the chocolate chips and pour the batter evenly into the cupcake liners. Bake for 15 to 20 minutes, or until set and a toothpick inserted comes out clean. I baked the muffins for closer to 20 minutes, but some smaller cupcakes took about 17 to 18 minutes. Remove to a wired rack to let them cool before frosting (or eat as is). For the Frosting: While your cake is baking, pull the pudding from the fridge to warm up to room temperature. Melt the chocolate chips and coconut oil (I do this in 30 second intervals in the microwave (about 2) stirring vigorously after each warm-up). Whisk in the pudding until smooth. Place in the fridge (or freezer if antsy) to let it set up. This should only take 15 or 20 minutes. Whisk and spread atop cooled muffins or cupcakes. Quadruple Chocolate??!? Hells to the yes, Alisa. I hope I can find some ZenSoy products around here, because I would love to enter. Your cupcakes (fuzzy picture and all) look delish! I could use one of those right about now. I am so happy you posted this recipe. These cakes look really good. They will be on my to make list. 🙂 Thank you. Yum! These look tasty, cupcake or muffin! Where did you snag some of those cupcake papers? How very suave. Oh! 🙁 I discovered Zensoy’s puddings when I was on exchange in America in 2007, and they remain to this day the only soy chocolate pudding – in fact, the only chocolate pudding – I’ve ever liked. And, of course… not available here in Australia. I look forward to seeing more Zensoy adventures in the blogworld, though! Oh my goodness Alisa. These sound (and look) out of this world. Pudding in the frosting – yes please! I love it. No wonder the bears hang out in your backyard! Holy richness, Alisa!! Those look amazing! What a cool contest and such an awesome prize!! If Conner was not sensitive to soy, I would totally join in this one. My mind is spinning with ideas of what you could do! And I am with Maggie on this, the bears are smart creatures. They know where the goodies are. ZenSoy pudding, eh? I need to investigate my local grocery store pudding situation. Those cupcakes sound downright decadent. And I love those cupcake liners! Those look and sound crazy decadent! That is a lot of chocolate- after a workout they’d be well-deserved! YUM. Wow. You’re brilliant with recipe creations my friend. No joke. Great contest! And congrats to teaming up with some awesome companies! Can’t wait to come up with my entry. Hmmm…..
wowsa, those look awesome. and i could see the pudding, egg sub! Alisa these look good. I can just imagine the hint of the coconut oil sneaking through. So tasty! Quadruple chocolate! Wow! They sure look heavenly delicious! substitute with some gluten free flour and i could SO do these. yummm! These look amazing. Just catching up on all the goodness you’ve been cooking up. Best chocolate cupcakes i have ever eaten or made. I served last night for valentines with hot fruit and coconut ice cream slivers. i added almond extract and coconut to the batter. also added shredded coconut on top while baking which got all toasty and browned. yum! Now this is high praise! Thanks for the feedback and your own serving ideas Lynn, and so glad you enjoyed the recipe! Hmm, good note about the date sugar, I will have to give it a try. I’m using a lot of coconut/palm sugar now, but imagine date sugar is a bit deeper, which I like. ps- date sugar has amazing taste! this was my first time baking with it. i’ll use it whenever i can now.